Practical, industry-specific counsel, backed by the firm’s 30+ business litigators and health care attorneys. Calfee’s Health Care litigators provide practical, industry-specific counsel, backed up by the firm’s 30+ business litigators and health care attorneys. We regularly represent clients in court, arbitrations, mediations, administrative proceedings and throughout various government investigation processes. Our clients include large and small health care providers, insurers, suppliers and manufacturers, and related industry players. 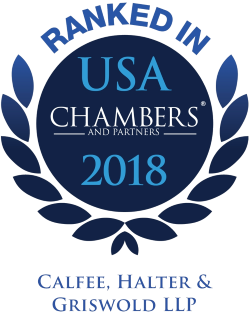 Calfee was selected for inclusion in the 2019 "Best Law Firms" rankings by U.S.News –Best Lawyers in America, with national and metropolitan Cleveland, Columbus and Cincinnati rankings in Litigation. Health systems and physicians in federal and state False Claims, Anti-kickback and Stark allegations, including negotiating settlements and corporate integrity agreements. Contract and tort litigation arising from billing and payment disputes between providers and insurers. Hospitals and physician groups in mergers, acquisitions, joint ventures, and buyouts. Area hospitals, clinics and other health care providers in litigation and disputes arising out of contracts with insurers, physicians, suppliers and others. Hospital and other health care providers in antitrust litigation. Health care employers in disputes and litigation with physicians and other medical professionals. Restructuring, governance, regulatory guidance and contracting for an academic medical center. Providers in creating and updating compliance plans. Hospitals in connection with grand jury investigations conducted by the Department of Justice Antitrust Division.